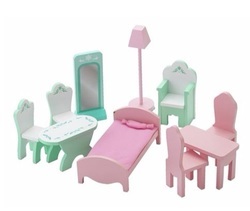 The Summer Winter Dolls house offers two different styles of play. On one side, the house is full of warm colours with a summery background and on the other, there are chilly icicles and frozen looking walls! These two contrasting themes will spark different imaginative stories as your little one moves the role play between the two sides of the house. There are 3 storeys in the Summer Winter Dolls house so there's plenty of space for occupants to move around. There are also ten pieces of furniture included to help them feel right at home!